A time ago, literacy was a rare and coveted skill. The only literate class of people was the clergy. The clergy studied and copied their religious texts and the remaining populace gathered to hear them read from those texts. Books were handmade, expensive and rare. With the advent of the printing press, books became accessible and affordable to other classes of people. Each letter was now being printed the same, each time. Where previously written information was dependent on the monk creating and reading the text, this transition opened up the process to almost everyone. The development of the moving image and multimedia as a whole, transitioned the populace once again. As scientists in 1967 speculated, the majority of information the human mind takes in is through body language, a visual language. Tone of voice plays a close second in our information gathering. Video technology has been available to the consumer market since the 1970’s, while techniques for filming arrived about one hundred years prior to that. Before video technology was available to the general public, private production was limited to traditional film. Directors absolutely needed to pay close attention to how they used the camera film roll. It was an expensive and exhausting undertaking with razors and tape in the editing room. Once the cost of production and running time was decreased, Video Home System (VHS) in place, directors were able to produce new moving images that captivated their audience ad nauseam. Even simply laying down on the floor in front of their video camera, inviting the viewers to step inside the television set and join them. Recently Time Magazine pointed out that we now have a shorter attention span than a Goldfish. While the written and spoken word will always have an important place in communication, online marketing will have to continue to adapt by shortening information segments and developing powerful symbolism. Alfred Hitchcock (famous for the long take) filmed the movie Rope (1948) in takes that were ten minutes or less. Cameras at that time could hold a maximum of only ten minutes worth of film. Some people will say that an important artistic aesthetic was forever lost in the medium of the moving image with the introduction of video. Others proclaim video ultimately had a positive impact for aesthetics in production overall. Particularly High Definition (HD) video has the ability to reduce the need for the mandatory (and expensive) lighting rigs needed to get proper exposure on film. David Lynch, speaking at a lecture on transcendental mediation, at Emerson College, shared how he disliked editing the movie Dune (1984), which ran for three hours in its special edition. He said if he was to direct that movie again he would simply use video, to hell with ‘film quality’ images. Back in the 1970’s, just as the Video Home System (VHS) revolution was kicking off, John Lennon commissioned a Chilean film director named Alejandro Jodorowsky. The film he created was based on ‘The Ascent of Mt. Carmel’ by St. John of the Cross and ‘Mt. Analogue’ by Rene Daumal, and was titled The Holy Mountain (1973). Successful video artists like Mathew Barney, have been re-shooting its imagery (with the long take, because video is cheap) and calling it cutting edge video art ever since. There was a recent documentary called Jodorowsky’s Dune (2013) which goes into detail about Jodorowsky’s ambition to make the Dune novels into a movie with the help of an art team that included Jean Giraud and H.R. Giger. He created a manuscript with artworks and shopped it around Hollywood. But Hollywood said ‘no’, ultimately black-balling his project and spent the next few decades plagiarizing the ideas from the manuscript. Jodorowsky crowdfunded the final investment for his latest project entitled ‘Endless Poetry’ in 2015. He even printed his own art dollars to distribute to his financial backers. 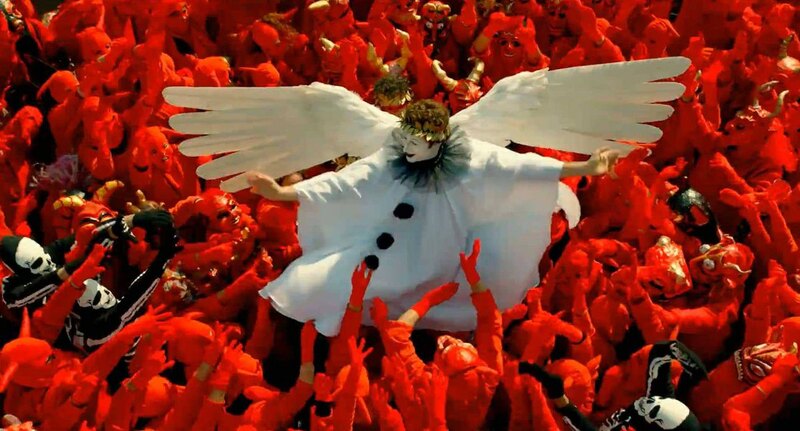 Given Jodorowsky’s record, you can bet this movie will be studied for a long time to come.